It goes without saying that fresh, homemade pasta is about a hundred times better than store-bought. What might not be quite so obvious, is how easy it is to make. Once you get the hang of it, you can make pasta from scratch in about the time that it takes to bring a large pot of water to the boil. This is my favorite all-purpose pasta recipe. I use it for making everything from spaghetti and pappardelle to ravioli and lasagna. I like to use a combination of all-purpose flour and semolina for the pasta dough. However, is you can't find semolina just substitute all-purpose flour. Also, I use an old, inexpensive hand-crank pasta machine for making my pasta. If you prefer, you can roll the pasta out by hand and cut it using a sharp knife. This recipe makes about 1 1/2 pounds of fresh pasta - enough for 4 generous servings. Place the semolina and all-purpose flour into the bowl of a stand mixer or food processor. Run the mixer on low for a few seconds to blend the semolina and flour. Crack the eggs into the bowl with the flour. Run the mixer on low speed until the pasta forms into a rough ball shape and comes away from the sides of the bowl. The pasta shouldn't be too sticky. If it's wet and sticky, add a tablespoon or so of extra flour and run the mixer again until the correct consistency is achieved. Form the pasta dough into a sort of oval shape with your hands, then wrap it in plastic wrap and allow the dough to rest at room temperature for 1 hour. Cut the pasta dough into 4-6 manageable pieces. They need to be small enough to fit through a pasta machine. Take one of the pasta dough pieces and flatten it out some with the palm of your hand. It needs to be thin enough to fit through the rollers of the pasta machine at its widest setting. Run the pasta dough piece through the pasta machine set at its widest setting. Fold the dough sheet in half and run it through the pasta machine again. 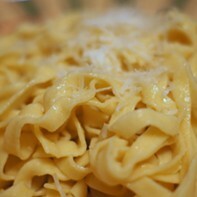 Repeat this process, adjusting the pasta machine to narrower settings, until you've achieved the thickness you desire. For spaghetti, you'll probably go to the narrowest setting. For lasagna, pappardelle and such, you'll want the pasta to be thicker. At this point, you could cut the pasta sheets by hand if you like. Or, you can pass them through the pasta machine with the pasta cutter now in place and adjusted to the size of pasta you want. In these photos I was making fettuccine. If you're not cooking the pasta right away, dust it with semolina or flour to keep it from sticking. 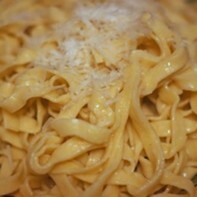 Cook the pasta and serve with your favorite sauce, such as the simple fettuccine Alfredo pictured here.